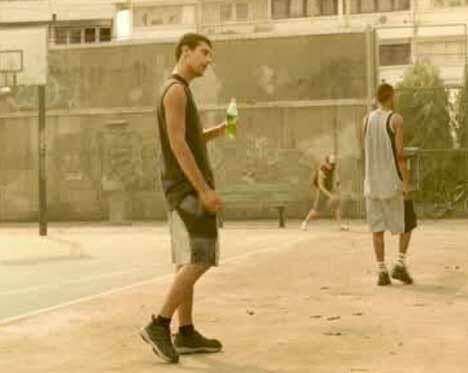 Sprite’s TV ad, “Liquid Freedom”, featuring a basketball court that morphs into a swimming pool, has had viewers obsessing over the music used in the spot. The ad, launched in March 2005, was shortlisted at Cannes 2005. It continues to raise interest around the world as viewers search for a downloadable copy of the music. ‘Liquid Freedom’ tunes into the longing to be totally submerged often associated with thirst. The ad uses a sepia filter throughout, emphasizing the dryness of the basketball court. It’s a hot day in the city. Basketball players on an outside court drip with sweat. One player quaffs his bottle of Sprite. In the 45 second version, a player strips his shirt off and dives headfirst into the court – which turns out to be a swimming pool. 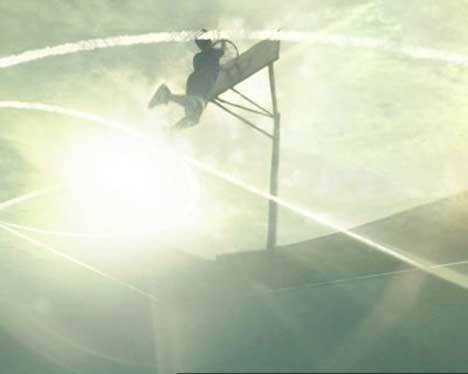 In the 30 second version he runs towards a bouncing basketball, about to kick it like a soccer ball, and falls… into what turns out to be a swimming pool. One by one the players take their dives onto the court and into the water. Underwater shots show us swimming players discovering new energy. From below we see players slam dunking on the hoop above the surface. At the end a Sprite bottle is thrown onto the court/into the pool. 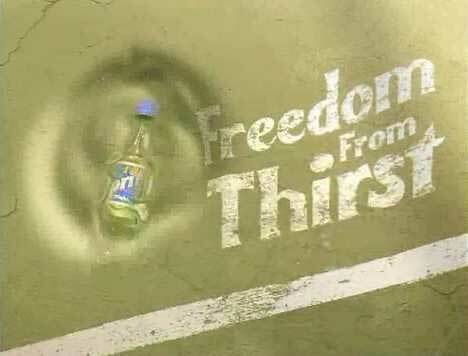 It bobs on the surface with the text, “Freedom from Thirst”. The ad was created by advertising agency Ogilvy and Mather, Hong Kong, with creative directors Simon Handford, Sylvester Song and agency producer Michael Soo. Director Josh Taft from Gang Films worked with producer Jean Villiers and Marcus Savage, director of photography Flavio Labiano. Offline Editor was Theirry Hoss. Gang Films host a 42 mb quicktime ‘making-of’ documentary’ showing the filming in Thailand. Post production was carried out by Kira Carstensen from HSI Productions. Editing was provided by BUF Compagnie, Paris and Los Angeles. There are at least two different soundtracks to the ad. Both begin with electric guitar effects that lead to the male vocalist’s lines. 2. I’m falling away with you … I’ll see you through. The music for the Sprite Liquid Freedom ad was created exclusively by staff at sound and music company Human Worldwide, New York. The music was not written or played by New Zealand band, Evermore, despite the attribution of a Limewire track to them. I stated earlier here that the music was performed by an unknown Australian band. People jumped to conclusions and assumed it was Evermore, even though Evermore are from New Zealand and not Australia. Benjamin Pacheco wrote and recorded the music for the first track. Pacheco told Boards that he wrote and recorded the music at home. For more of Pacheco’s work see his band site Mus-OK and Mus-OK MySpace site. The track is now hosted at the Union Devoe MySpace site, named Counting Backwards, and can be downloaded there as an mp3 audio file. The ‘Falling Away’ track was written by Lindsay Jehan, Hugh Wilson, Andy Bloch, and Morgan Visconti at Human Worldwide. The song was recorded at Human Worldwide’s studio by Hugh Wilson (vocals) and Lindsay Jehan (instruments), Australians living in New York at the time. Wilson is performing the full song at his live shows. Hugh Wilson has the track available to play on his MySpace site. Their band is shown here in an extended version of the Sprite ad. I’m falling away with you.. This 30 second music track is available on Limewire, wrongly attributed to Evermore. The 3:45 minute Sprite commercial soundtrack was available to download from Sprite Netherlands website, as a 3.44 mb mp3 track but it is not currently working. Thanks to Thijs for the tip in his comment below. It appears as though Coca Cola Netherlands have blown their bandwidth with the demand for the song. TJ’s comment below for instructions on downloading the full mp3 track from www.sprite.de. Sprite Germany is running a music video competition using the Falling Away track and offers the original 3 minute track, along with remixes. 2. Select AM SPRITE CLIP BATTLE TEILNEHMEN! You can choose from the Original, Go Disco, Chillout, ElektroPop and the Urban Beat versions (all 192 kBit/s). EASY EASY EASY! Alternatively just go to www.sprite.be, click on TV Advertisement and download the music.